Slow cooker? Crock pot? What do you call it? I think I use both terms about equally. Well, whatever you call it, it’s time to dust it off and give it a place on your counter! For some reason I don’t use my slow cooker at all in the summer. Slow cookers make me think of comfort food. In the summer I’m all about light options, especially those that involve the grill. But now the cooler weather is moving in, and the crock pot has won its way back to my counter! 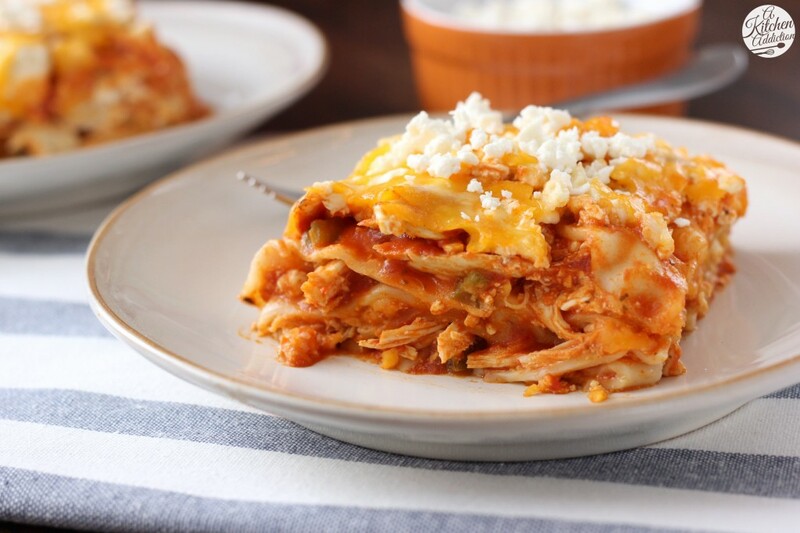 It got its first opportunity to prove itself with this slow cooker buffalo chicken lasagna! It didn’t let me down. After a bit of prep work for the ingredients and throwing all the ingredients together, I sat back and let the slow cooker work for me. A few hours later, mouthwatering spicy smells started filling our house, and we had some delicious comfort all ready to go. 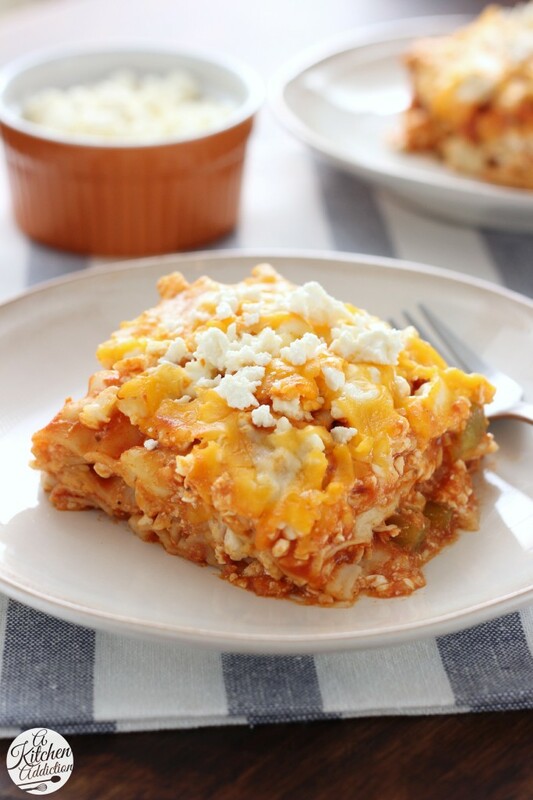 If you like buffalo chicken, then you’ll love this twist to traditional lasagna. All of the flavors of buffalo chicken are layered with pasta and cheese. What’s not to like?! Plus, you can mix the layers the night before, so preparation in the morning is minimal. Want to make it even easier? Pick up a rotisserie chicken and you don’t even have to take the time to cook the chicken. Super easy. See? It’s time to finally dig out your slow cooker and give it the attention it deserves! In a large bowl, stir together chicken, buffalo sauce, spaghetti sauce, bell peppers, and tomatoes. In a small bowl, stir together ricotta cheese, mozzarella cheese, ½ cup cheddar cheese, and ½ cup feta cheese. Spread about 1½ cup of chicken mixture in the bottom of a 5-6 quart slow cooker. Layer with 3 noodles (may need to break noodles to fit). Top with 1½ cups chicken mixture. Top with ⅓ of the cheese mixture. Top with another 3 noodles. Repeat with another layer of chicken mixture, cheese mixture and 3 noodles. On the top of the last noodles, top with remaining chicken mixture and remaining ⅓ of cheese mixture. Sprinkle with remaining ¼ cup cheddar cheese and ¼ cup feta cheese. Cover and cook on low for 4-5 hour or on high for 2.5-3 hours. Turn off heat and allow to sit for 15 minutes before serving. Oh my gosh! YES PLEASE!!! I love all things buffalo chicken. This lasagna looks phenomenal! I just bought a new bottle of buffalo wing sauce. Looks like it might come in handy pretty darn soon. My husband is a Buffalo native, so Frank’s RedHot has a permanent place in about half of our meals! Haha. This looks awesome! I actually used my slow cooker all throughout the summer, mostly for the convenience aspect, but I agree that it brings to mind all the comfort foods synonymous with fall and winter. 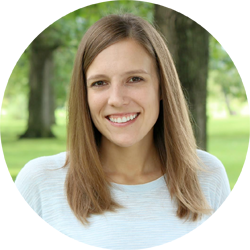 I’m in love with this slow cooker dish, Jessica! What a fun flavor, so much better than regular ‘ole lasagna. Pinning! This might just be the perfect lasagna. Seriously!!!! 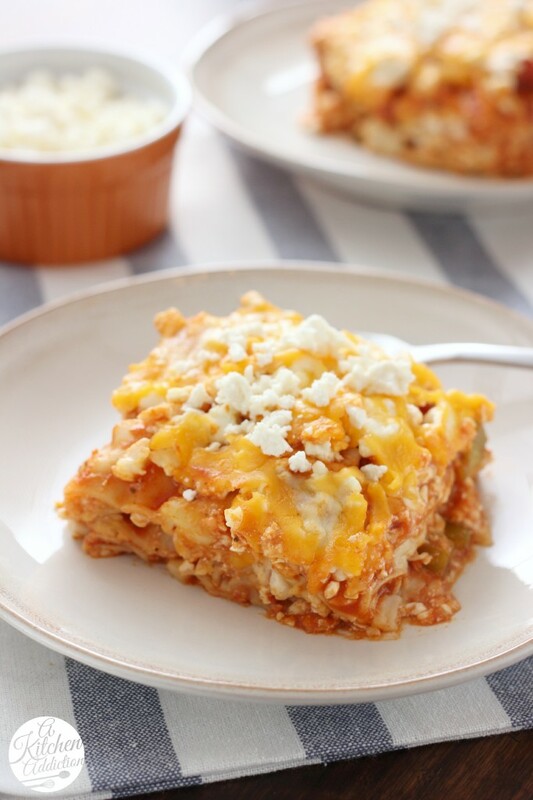 what a fun twist on regular lasagna! I just fired up my slow cooker yesterday. I have only used it once during the summer. I have never tried anything like lasagna in the slow cooker. I am quite curious how that would turn out. Yours looks wonderful. So I pinned the recipe. You already tested it. This looks great! I bet it would be good with blue cheese crumbles instead of the feta! I am trying it tonight with blue cheese crumbles instead of the feta…I also added a few drizzles of ranch dressing. ..I’ll let you know how it turns out—smells amazing! Oh, love the addition of ranch! Can’t wait to hear how it turns out! LOVING this! It came out so perfect for cooking in the slow cooker! Gorgeous! Such a brilliant idea!! Making this soon! When I’m talking I use crockpot, but when I’m writing are you slow cooker. Is that weird? Buffalo chicken is always a slam dunk! Wow, you made this in a slow cooker? I am impressed! It looks so good. I need to break out my crockpot more often and try this lasagna! 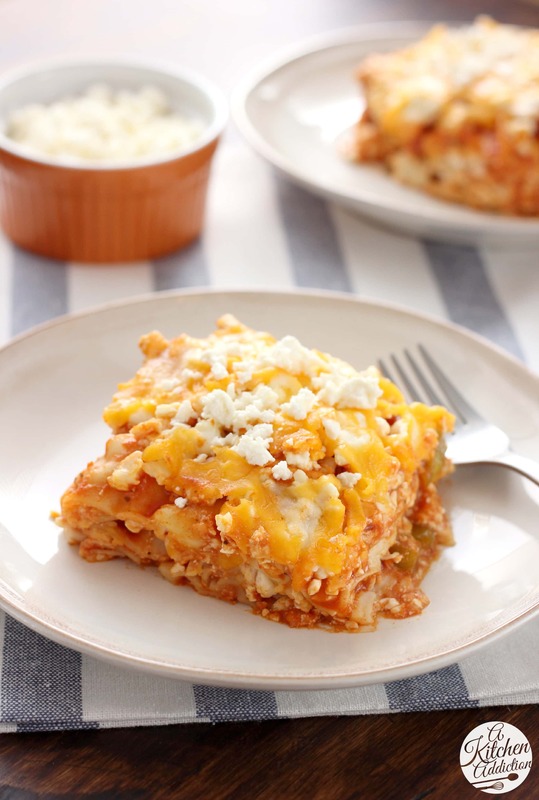 Oooo I love the idea of buffalo chicken lasagna! What a fun twist! And I do love making lasagna in my crockpot! This looks unREAL. Lasagna in the slow cooker — I need to try it! I love this idea and ESPECIALLY love that it’s made in the slow cooker. Just the kind of meal I crave this time of year. I seriously LOVE this… and am thinking I need to get to the grocery store first thing tomorrow to make this for dinner ASAP. I can’t wait! 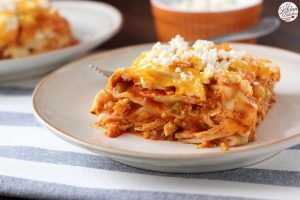 I have always wanted to make lasagna in the slow cooker – and this looks amazing!! I love this buffalo spice lasagna infusion. It’s one of my favorite football flavors! I think that I love just about Buffalo anything (funnily enough I’ve never been to Buffalo), and this lasagne is right at the top of the list…yuuuum! Fantastic idea! I love the combination of flavors in the lasagna. What a creative lasagna! I think I could cook in my slow cooker every day this time of year! I am so looking forward to trying this recipe! We love buffalo flavored meals too! I just have one question as I’ve never done lasagna in my crock pot (yes I most commonly use crock pot). Do the lasagna noodles need to be precooked? Thank you so much! I hadn’t made lasagna in the crock pot before this, either! But now that I have, I wish I had tried sooner! 🙂 No, you don’t need to precook the noodles. Looks so yummy! Just wondering if it’s a red pepper or green pepperin this? You can use either red or green peppers. I used green peppers. So yummy I have made this 4 times already and everyone has loved it. They keep asking me to make it again. I’m so glad you liked it! Thanks for letting me know! You put them in uncooked. Hope that helps! I made this once so far. We all liked it, but I thought the amount of buffalo wing sauce made this way too hot/spicy for my taste. The wing sauce overwhelmed the entire dish. I plan to make this again, but with less wing sauce (maybe 3/4 or half the amount) and use blue cheese crumbles instead. Because really as a Buffalo native, hot sauce and bleu cheese go hand-in-hand. Thank you for an easy and convenient recipe!